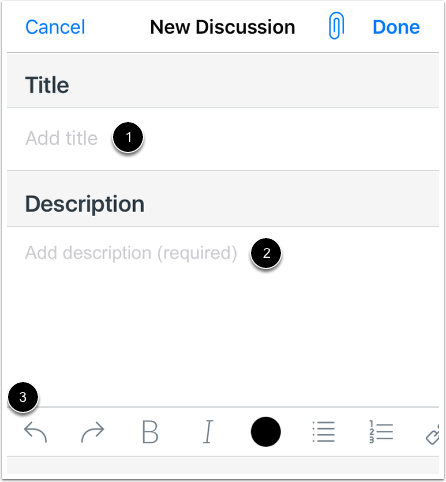 How do I add a discussion in the Teacher app on my iOS device? 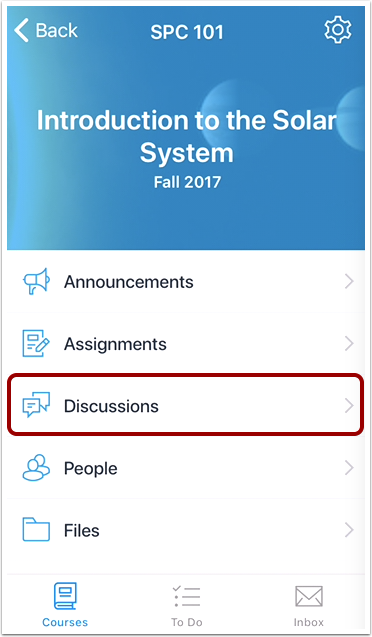 You can add an ungraded discussion in your course using the Teacher app. Note: Graded discussions cannot be added using the app. To add a discussion, tap the Add icon. In the Title field , add a title for the discussion. In the Description field , add a description for the discussion. You can use the Rich Content Editor to format your title and description . Learn more about using the Rich Content Editor. 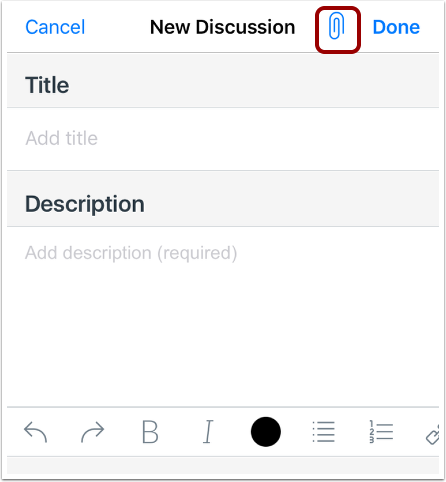 To publish your discussion, tap the Publish button . To allow threaded replies, tap the Allow threaded replies button . To subscribe to the discussion, tap the Subscribe button . 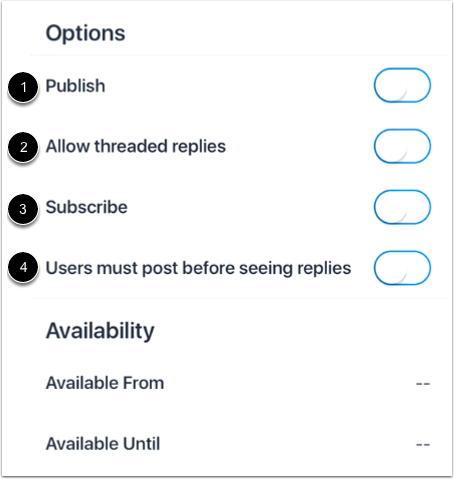 If you want to require users to have to post to the discussion before seeing replies from others, tap the Users must post before seeing replies button . To set availability dates for the discussion, tap the Available From option  and/or Available Until option . For each option you can set a date and time. 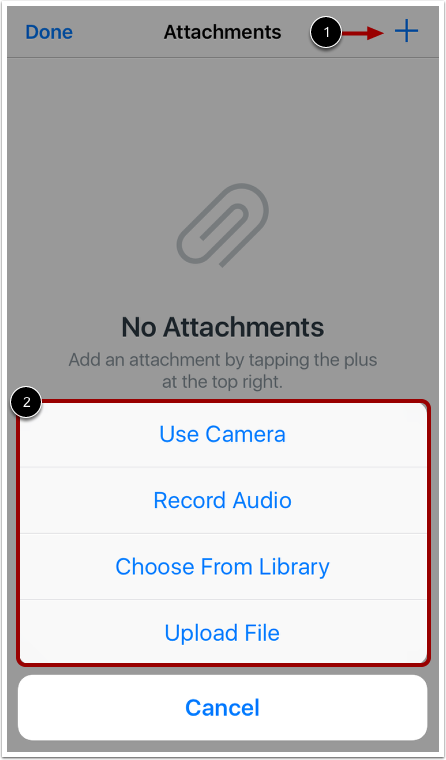 To add another attachment, tap the Add icon . To return to your discussion, tap the Done link . Previous Topic:How do I view Discussions in the Teacher app on my iOS device? 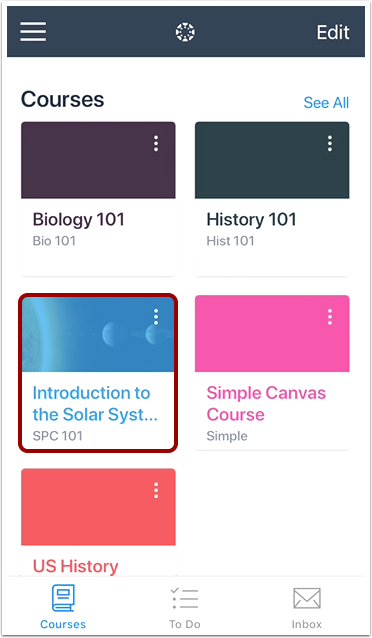 Next Topic:How do I view Course Files in the Teacher app on my iOS device? Table of Contents > Courses > How do I add a discussion in the Teacher app on my iOS device?